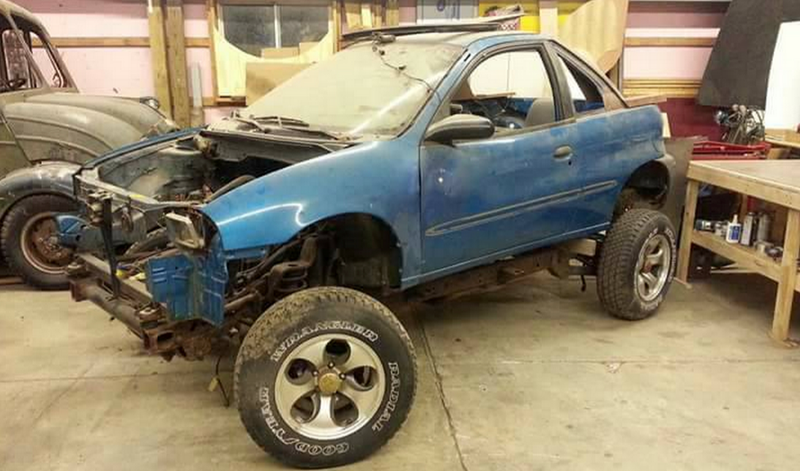 This is a Geo Metro body on a Jeep Wrangler TJ frame—a Jeep-nut’s worst nightmare. I get it, the cars have the same wheelbase, but just because it can be done, definitely doesn’t mean it should. This is a 96 jeep wrangler that was in an accident. It has a clear green title. Body was removed. All stock 4cylinder automatic 4wd. 77000 original miles. Has 96 geo body on it. Have full wiring harness, rad and all other parts to make run. Motor trans, transfercase, and axles all good. lot drives. Would make good off road mud toy. Someone please save this TJ platform from its sad, sad existence under one of the America’s crappiest econoboxes.